Ian Serraillier was always popular in my country (Malta), which, although bilingual in its national language and English, has always endeavoured to increase the general proficiency in the latter language.To a certain degree such books proved to be a success in Malta. Serraillier's style makes it suitable for schools in the lower forms. I remember how my classmates used to love his books (especially the 'New Windmill Series' versions),although I believe that they are only to be found gathering dust in some libraries nowadays unfortunately. 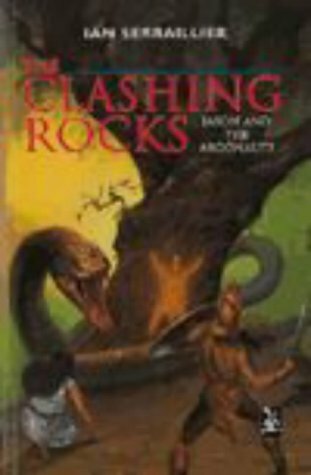 'The Clashing Rocks' is about the fantastic voyage of Jason and the Argonauts, beautifully illustrated by William Stobbs.The quest for the golden fleece is a tale from Greek mythology which many know about but which few have had actually read about. It is confusing at times, especially due to its length, its many characters and their strange names (like Cyzicus, which I had in vain had tried to remember) and some weird adventures. The sheer number of the Argonauts, totaling fifty in all, does not help at all. From Orpheus to Heracles, there was no shortage of epic heroes...However, Serraillier has overcome his own difficult quest of making such an amazing adventure accessible to the young masses out there by using his secret weapon, leaving all the unnecessary details out. Yes, it is a short book. One could easily read it in a couple of minutes, yet there is no chapter that could have been left out. Trust me, making such a tale so short and sweet is a remarkable achieving in its own right, worthy of the hero Jason himself.In my opinion, every parent should make a worthwhile investment in a library well stocked with some well-chosen Serraillier titles, and not with nonsensical rubbish that is being advertised as children's literature nowadays. Ian Serraillier - Ian Serraillier was a British novelist and poet. He was also appreciated by children for being a storyteller retelling legends from Rome, Greece and England. Serraillier was best known for his children's books, especially The Silver Sword (1956), a wartime adventure story which was adapted for television by the BBC in 1957 and again in 1971.He was born in London, the eldest of four children. His father died as a result of the 1918 flu pandemic when he was only six years old. He was educated at Brighton College, and took his degree at St Edmund Hall, Oxford and became an English teacher. He taught at Wycliffe College in Gloucestershire from 1936 to 1939; at Dudley Grammar School in Worcestershire from 1939 to 1946; and at Midhurst Grammar School in West Sussex from 1946 to 1961. As a Quaker, he was granted conscientious objector status in World War II.In 1946 his first children’s novel was published. It was followed by several more adventure stories of treasure and spies. His best known work, The Silver Sword, was published in 1956 and has become a classic, bringing to life the story of four refugee children. Three of the children are siblings: Ruth, Edek and Bronia. Jan is another of the many Warsaw war orphans who somehow had met their father, and then fainted near the bombed out basement which served as home for the siblings, and was taken in by them. The four joined together in their search for the siblings' parents in the chaos of Europe immediately after the Second World War. In the United States the book was published under the title Escape from Warsaw.As well as children’s novels and poetry, Serraillier produced his own retellings of classic tales in prose and verse, including Beowulf, Chaucer and Greek myths. Together with his wife, Anne Margaret Rogers, he founded the New Windmill Series in 1948, published by Heinemann Educational Books, which set out to provide inexpensive editions of good stories. He continued as co-editor of the series until the onset of Alzheimer's disease in the early 1990s. The illness finally contributed towards his death in November 1994 at the age of 82.